Prime Location! 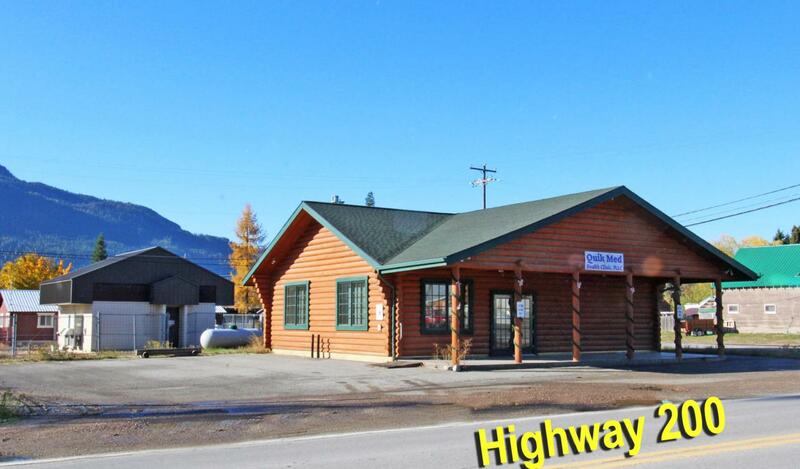 Commercial Building in Clark Fork City limits! Ready for your business, commercial retail center, restaurant, gift store, endless opportunities, unlimited possibilities! Receptionist area, waiting room, exam rooms, office, 2 bathrooms, & Kitchen/break area. OSHA specs, commercial grade laminate over hydronic in-floor heat & is energy efficient. Paved parking with drive-thru potential. Excellent highway frontage w/visibility on Hwy 200E. 8 miles East to Big Sky Montana, 8 miles West to the exclusive Hope area & 25 miles to Sandpoint. Surrounded by the Monarch, Cabinet & Selkirk Mt. Ranges. Incredible recreational area, fishing, hunting, hiking, bicycling tours and nearby golfing & skiing. Minutes to beautiful the Lake. Two commercial lots fronting the Hwy. Owner may finance.